There are some who question Mack’s decision to go with Plank instead of the great Jack Coombs (28-12 this year with a 3.53). But Plank is a nervous, excitable sort, and Mack seems to think he’ll be calmer in front of a friendly home crowd. Coombs, much cooler and even keeled, could care less where he pitches. He will shoulder the load at the Polo Grounds in Game 3. GIANTS RUBE MARQUARD. One look at the name “Rube” Marquard and you’d think the Giants would be sending a country hayseed out to pitch Game 2. Not so. He was born in Cleveland, and is a city boy through and through. 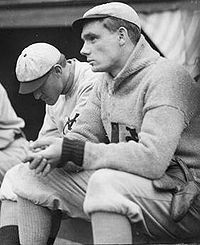 He got the nickname by a writer in Indianapolis who compared him with former Athletic great Rube Waddell. Of course, those similarities go no further than the diamond; Marquard doesn’t leave the hill to chase after fire trucks. He has a blazing fastball, but prefers to use his forkball and a screwball he learned from Matty. “Any hitter can hit a fast one,” Marquard says, “But not many can hit slow ones.” Marquard, who was signed for the unheard of price of $11,000 in 1908, struggled in his first 3 seasons and was known as the “$11,000 Lemon” until this year. 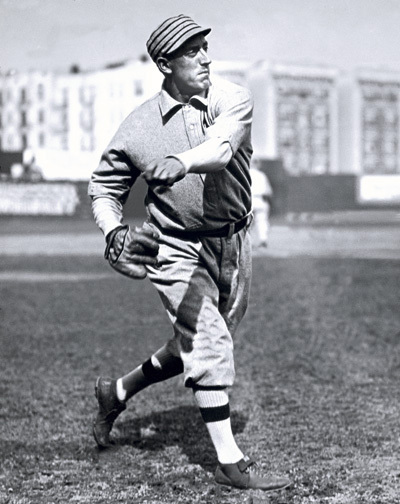 Many credit new Giants assistant coach Wilbert Robinson with turning Rube’s fortunes around. He went 24-7 with a 2.50 ERA this year, fianlly living up to the potential the Giants were looking for when they paid all of that money for him. WATCH THE GAME HERE! We will be showing the game up on the big board at 2 p.m. today, very similar to the board the New York fans will be watching in Times Square. Be back here at 2 p.m. for first pitch! –All quotes in the previous piece are actual quotes from the actual players. In some cases I have changed the case to make it present instead of past. A lot of info in this post was supplied by the book Connie Mack and the Early Years of Baseball. -ed.